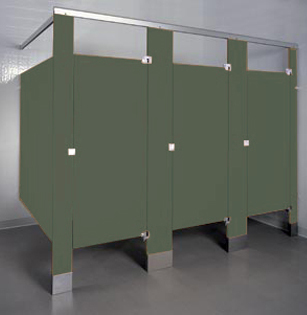 Powder coated steel bathroom stalls provide high-tech quality at an economical price. The powder coated finish is electrostatically applied over galvannealed steel, which protects against corrosion and provides a proper base for the finish. The finish is highly resistant to wear, fading, staining, scratching and scuffing. It is easily cleaned with mild soap and wiped dry. 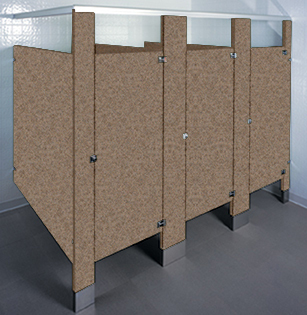 Plastic Laminate toilet partitions are available in hundreds of designs ranging from classic woodgrains to solid colors. Very economical with a highly durable plastic surface that will not rust or dent. Dirt, grease, and cosmetics will not penetrate surface. 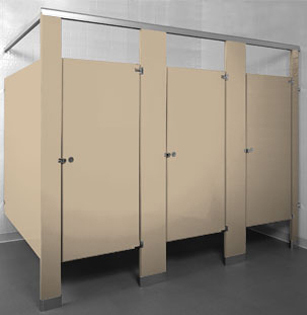 Plastic Laminate bathroom stalls solution for broken, dented, rusted and vandalized partitions. Solid Plastic material is solid, one inch thick HDPE (high density polyethylene). It is impervious to moisture, so it rust, delaminate, mildew or absorb odors. The color goes all the way through the material, so Solid Plastic (HDPE) never needs painting and scratches can easily be repaired. Solid Plastic is highly impact resistant so the dents and broken doors that are so common with other types of partitions are practically eliminated. Graffiti is also no match for Solid Plastic – it can be easily wiped away with ordinary cleaners. 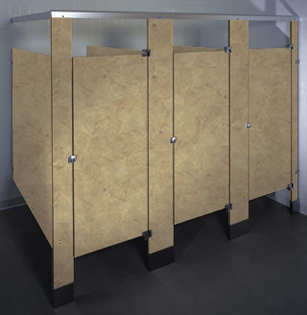 Phenolic Black Core bathroom stalls are decoratively faced on both sides of a resin-impregnated kraft paper core. The surface and core sheets are fused at high temperature and pressure. In addition to strength and serviceability, a wide range of colors provides limitless design flexibility. 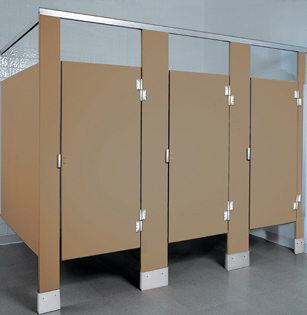 Phenolic Color Thru bathroom partitions offer all the strength and durability of our Phenolic black core, with the added advantage of consistent matching color throughout the core, forming a one piece panel which will not delaminate. Excellent choice for high traffic areas. Phenolic Color Thru are durable, water-resistant, and come in a wide range of colors. Perfect for humid environments or anywhere style and durability are important factors. 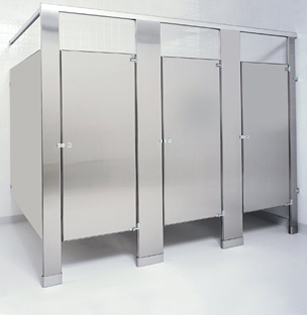 Stainless steel bathroom stalls are virtually indestructible and retain their gleaming beauty indefinitely. These units combine the strength of #304 stainless steel with a #4 satin finish or textured finish, formed and bonded to a honeycomb core. The face sheets are held rigid and permanently in place by an interlocking strip welded at each corner. Stainless steel components are impervious to just about any substance. Even scratches caused by deliberate vandalism can be removed by buffing.